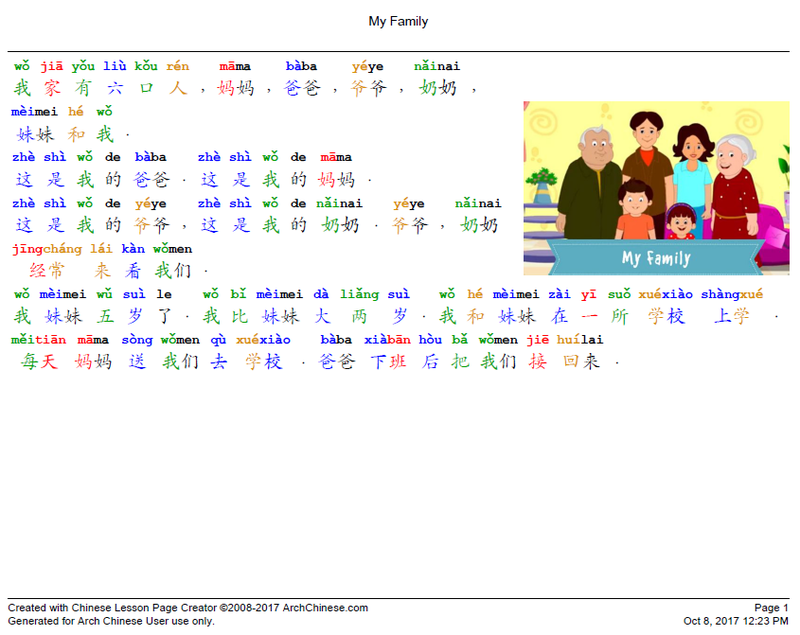 This tool allows you to create custom Chinese lessons and supplemental reading materials tailored to your classroom and the needs of your Chinese language students. For example, you can create a Chinese New Year themed lesson when the Chinese new year is around the corner. The system will annotate the Chinese lesson text with Pinyin and optionally color code the Chinese characters and Pinyin based on the tones of the characters. If you have a color printer, it is recommended to use color-coded tones. You can also add a clip art image to the lesson page to make the lesson more interesting and engaging. You have the option to create a high-quality PDF file for printing or a PowerPoint presentation for classroom use. Enter the name of the lesson, such as My Family. The name will be shown at the top of the lesson sheets. Optionally, click the Load Image button to load the theme image you would like to use. Alternatively, click the Search Image button to search an image from the images uploaded by you or other Chinese teachers. The image will be shown on the upper-right corner of the first page. The image will be scaled accordingly based on the paper type and the size you have specified on the Settings. If you use an image that you don’t own the right to, you should give credit to its source. You can enter something like "Image by (name of author, or link to the source)" into the Image Credit box. The credit will be shown on the footer of the generated pages. 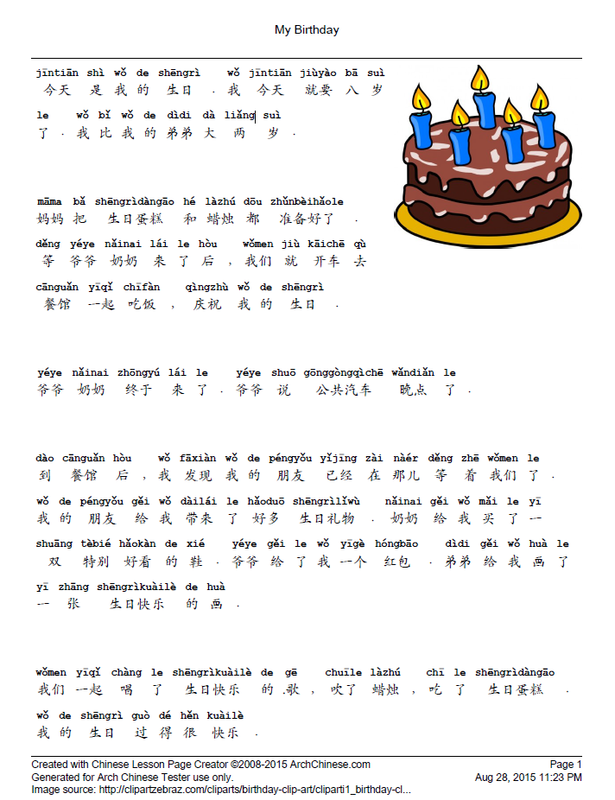 Enter or copy and paste the Chinese lesson text into the lesson text box. Hit the Review Annotation button to make sure the system has correctly marked up the words and provided the correct Pinyin for the words and characters. The words and characters are listed below the Review Annotation button. You can edit the words and Pinyin as needed. Click the trash icons to remove the rows if they are no longer needed after editing. Do not remove the system generated empty rows because they are used to indicate paragraph breaks. Press the Print Lesson button to generate the lesson pages. Optionally, hit the Save button to save the words and characters from the lesson so that they can be used in other Arch Chinese teaching and learning tools, such as the flashcard marker, bingo card maker, Chinese quiz maker and puzzle generator.